Ed checked in on May 17, 2008 with the following picture of Just Friends racing off Block Island's Southeast Light, circa 1990. 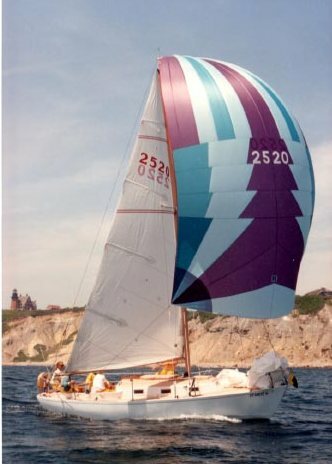 Ed owned and raced Just Friends, sail # 2520 for about 12 years - 1982-1994. This was a boat with such an outstanding race record that her owners kept repainting her hull and changing her name to disguise her from the competition! Ed bought her with a red hull, painted her white and changed her name to Just Friends. Her previous owner Roland McGuire, bought her blue, painted her red and named her Redheds. Before that, Andy Anderson bought her white, painted her blue and named her Tigress. Made no difference - she was a winner. Unfortunately, after Ed sold her her luck ran out - she is now blue again, and named Darwin. At this writing Darwin sits abandoned in a boat yard with an uncertain future. Ron - You noticed the smaller chute - it was our "reacher", a 3/4 oz designed to keep her rail out of the water when it blows. Looks like the wrong chute for that breeze, though. Our "max" chute was a 1/2 oz and was hard to trim on a reach in 15+ knots. Fond memories!